Iranian Foreign Ministry Spokesman Bahram Qassemi made the remarks in a Sunday statement in response to some paragraphs of the final communiqué of the meeting of the Foreign Ministers of the Group of Seven (G7) in France, in which they discussed issues related to Iran. Qassemi said the Islamic Republic believes the content of this communiqué, which is based on groundless accusations and misapprehension of Iran’s peaceful nuclear program, its regional role and missile program, is unconstructive and completely unilateral. Iran maintains that these accusations clearly violate the Joint Comprehensive Plan of Action (JCPOA) and the commitments of the three European countries, he added. “It is a source of regret that the members of this group are influenced by the illegal and bullying behaviour of the United States, and are repeating false claims against Iran, using a rhetoric that they themselves admit does not belong to them,” Qassemi noted. The Iranian spokesman denounced as untrue and unrealistic the stances expressed by the G7 on Tehran’s constructive and undeniable role in consolidating stability, security, and in fight against terrorism in the West Asia, and reiterated the peaceful and defensive nature of the country’s missile program. “Having complied with its international obligations, the Islamic Republic of Iran has shown its good faith in engaging, negotiating and maintaining contact with the international community,” he said. Tehran believes that setting forth unrealistic issues and making unsuccessful attempts to portray Iran as a threat will not affect the determination of the Iranian people and the Islamic Republic’s approach to pursue its national interests in the region and the world, he added. Qassemi also condemned the violations of the fundamental principles of the Iran nuclear deal by the three European countries, calling on them to provide a clear explanation. He emphasised that the Islamic Republic of Iran will pursue this issue using the mechanisms existing in the JCPOA. At the end of a two-day meeting in the northwestern French city of Dinar, foreign ministers of the Group of Seven could not bridge differences on the Israeli-Palestinian conflict and how to deal with Iran. “We intend to continue our work to counter Iran’s regional proliferation of ballistic missiles and its unlawful arms transfers,” reads the communiqué. 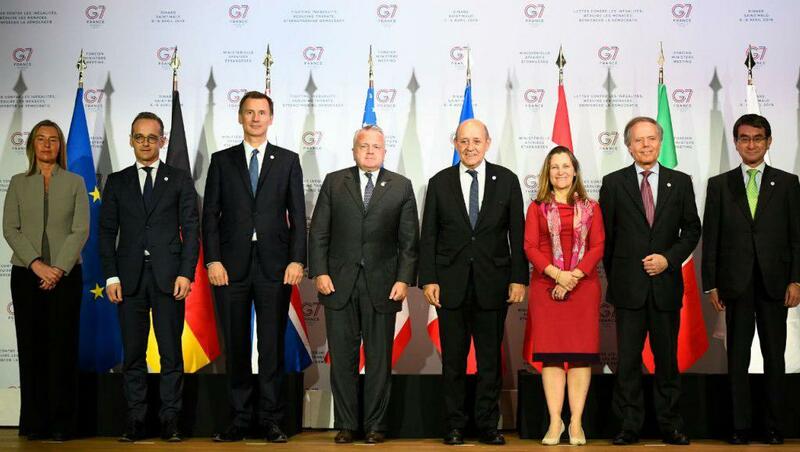 The Group of Seven (G7) is a group composed of Canada, France, Germany, Italy, Japan, the United Kingdom, and the United States. These countries represent most of the global net wealth.